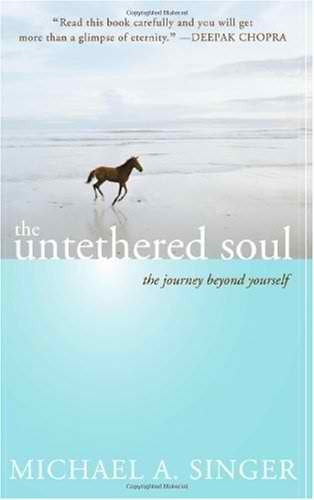 The Untethered Soul is a spiritual journey that explains how you can transform your thoughts into more positive thinking while conquering and overcoming your fears and negativity. The book touches on such a wide variety of topics that will truly help readers that need some direction on how to handle inner thoughts and just life overall in a more positive light. One of the more important messages Singer teaches is how to live in the present moment instead of constantly focusing on what to avoid and what to plan in the future. Singer also goes into explicit detail regarding how to let go of painful memories that prevent us from achieving ultimate happiness. The book is divided into five main sections: Awaking Consciousness, Experiencing Energy, Freeing Yourself, Going Beyond, and Living Life. In "Awaking Consciousness", we learn how to manage the inner dialogue that constantly runs through our minds; especially when it keeps us from being unproductive. "Experiencing Energy" teaches us how to open our minds to our internal energy, while sections three and four touch base on how to positively separate ourselves from the rest of the world. Lastly, in section five "Living Life", we are taught how to understand and appreciate happiness in its truest form. The Untethered Soul is not at all religious and not completely spiritual, but rather explores subjects that will make perfect sense to those more in touch with science and health. Of course, to those healthier readers, much of this book may seem like common sense, but either way is a great guide to getting back in touch with the more important things in life. If you enjoy this book, I highly recommend checking out additional works on http://noetic.org, including the books shown below.